With dramatic views of Lago Llanquihue and the Osorno and Calbuco Volcanoes, five star Hotel Cumbres Puerto Varas artfully combines the intimacy and warmth of a Patagonian lodge with expansive windows and native wood and stone design elements, offering guests a true connection to the breathtaking landscape of southern Chile. Throughout the lobby, overstuffed armchairs and sofas sit invitingly close to the log fireplace, offering the perfect spot to relax after a day of exploring. Each of the 90 guest rooms has been designed to be comfortable, elegant and simple, offering majestic views of the lake and mountains, and some rooms having balconies. Just off the lobby, guests may dine in the romantic Cumbres del Lago Restaurant or unwind over cocktails in Bar La Araucaria or by the fireplaces in the Winter Garden lounge. The hotel also features a spa with a heated pool, sauna and fitness center. 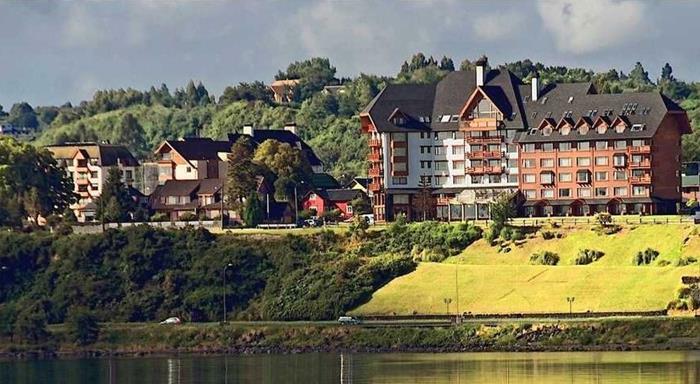 In 2013, Hotel Cumbres Puerto Varas was awarded Tripadvisor's 'Travelers Choice Award' for the second consecutive year. All rooms are decorated with native wood and natural fibers of southern Chile and have air-conditioning and independent heating, super king bed or two double beds, free Wi-Fi, cable TV, minibar, a separate bath and vanity, national and international direct-dialing, safe-deposit box and magnetic card access. Superior rooms are 377 sq. feet and have panoramic views of Lake Llanquihue and the volcanoes. Deluxe rooms have balconies and are 377 sq. feet with panoramic views of Lake Llanquihue and the volcanoes.